One more fantastic artist – Paul Signac. Paul Signac was born in Paris on 11 November 1863. He followed a course of training in architecture before deciding at the age of 18 to pursue a career as a painter after attending an exhibit of Monet’s work. He sailed around the coasts of Europe, painting the landscapes he encountered. He also painted a series of watercolors of French harbor cities in later years. Then he met Claude Monet and Georges Seurat. He was struck by the systematic working methods of Seurat and by his theory of colors and became Seurat’s faithful supporter, friend and heir with his description of Neo-Impressionism and Divisionism method. Under his influence he abandoned the short brushstrokes of impressionism to experiment with scientifically juxtaposed small dots of pure color, intended to combine and blend not on the canvas but in the viewer’s eye, the defining feature of pointillism. Many of Signac’s paintings are of the French coast. He loved to paint the water. He left the capital each summer, to stay in the south of France in the village of Collioure or at St. Tropez, where he bought a house and invited his friends. In 1886 Signac met Vincent van Gogh in Paris. In 1887 the two artists regularly went to Asnières-sur-Seine together, where they painted such subjects as river landscapes and cafés. Initially, Van Gogh chiefly admired Signac’s loose painting technique. In March 1889, Signac visited Vincent van Gogh at Arles. The next year he made a short trip to Italy, seeing Genoa, Florence, and Naples. In 1888, Signac discovered anarchist ideas by reading Elisee Reclus, Kropotkin and Jean Grave, who all developed the ideas of anarchist communism. With his friends Angrand Cross, Maximilien Luce and Camille Pissarro he contributed to Jean Grave’s paper Les Temps Nouveaux (New Times). His financial support was considerable; he sent regular cheques and made a gift of his works for five lotteries between 1895 and 1912. Signac’s 1893 painting, In the Time of Harmony was originally titled In the Time of Anarchy but political repression targeting the anarchists in France at this time forced him to change it before the work could be accepted by a gallery. Signac loved sailing and began to travel in 1892, sailing a small boat to almost all the ports of France, to Holland, and around the Mediterranean as far as Constantinople, basing his boat at St. Tropez, which he “discovered”. From his various ports of call, Signac brought back vibrant, colorful watercolors, sketched rapidly from nature. From these sketches, he painted large studio canvases that are carefully worked out in small, mosaic-like squares of color, quite different from the tiny, variegated dots previously used by Seurat. Signac himself experimented with various media. As well as oil paintings and watercolors he made etchings, lithographs, and many pen-and-ink sketches composed of small, laborious dots. The neo-impressionists influenced the next generation: Signac inspired Henri Matisse and André Derain in particular, thus playing a decisive role in the evolution of Fauvism. As president of the Société des Artistes Indépendants from 1908 until his death, Signac encouraged younger artists (he was the first to buy a painting by Matisse) by exhibiting the controversial works of the Fauves and the Cubists. Signac served as a juror with Florence Meyer Blumenthal in awarding the Prix Blumenthal, a grant given between 1919-1954 to painters, sculptors, decorators, engravers, writers, and musicians. 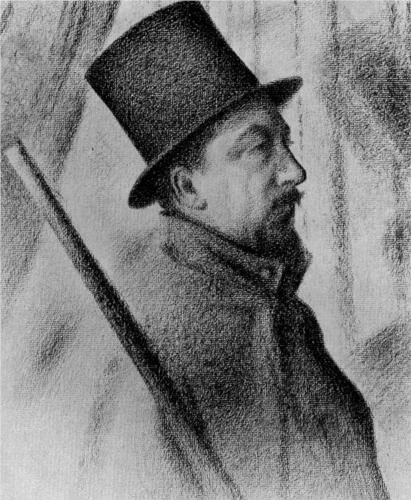 Paul Signac – Painted by Georges Seurat. This entry was posted in Art and tagged Art, Biography, Impressionism, Painter, Paul Signac. Bookmark the permalink.